This book is a welcome departure from the pampered lords and ladies of Regency England. Set in the time of the Crusades; when a devout and battle hungry Richard the Lionheart occupied the throne. 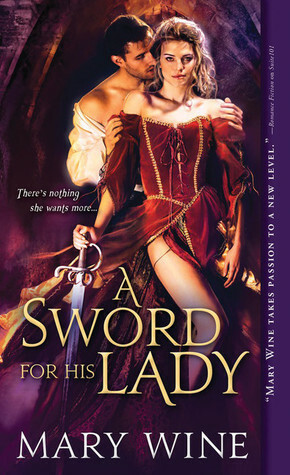 A Sword For His Lady is the story of a faithful knight, who meets his match in the form of a brilliant and beautiful widow. If you think that things end there however, you are sadly mistaken. That, dear friends, is where the adventure and the mayhem begins for these two. And now...on to the review! The first half of this book concerns itself mainly with our knight, one Roman de Segrave. Having just returned with the king from the front lines of battle against Muslim forces; Roman finds himself given the title of Baron, land, and and advised to wed the young widow on the neighboring estate. That he might join the two and better protect the valuable property which sits so close to the Welsh border. Oh the plotting minds of men! But...fear not! Lady Isabel of Camoys is more than capable of dealing with a few knights! The archaic attitudes of the menfolk in this read can be rather off-putting, considering the fact that Isabel is doing quite well without their interference. She has the land, is making money, and even has her own stone quarry. In truth, it is Roman, who is doing all he can to get her to see the merit of his suit. Admittedly, Roman faced quite the challenge with this lady. She held out against his charms in fact, that I started to get worried! There was...of course, some saving of the damsel in distress to be done. She is housing a garrison of knights, after all! The twist here being the person from whom our dear lady needed saving. This is the twist that put this book on the road to 5 stars. It also served at the catalyst for big romantic changes between Isabel and Roman. If you are looking for a romance where men are men and women rule all...THIS IS IT!